To Cite: Alavian S M, Rezaee-Zavareh M S. Daclatasvir-based Treatment Regimens for Hepatitis C Virus Infection: A Systematic Review and Meta-Analysis, Hepat Mon. 2016 ; 16(9):e41077. doi: 10.5812/hepatmon.41077. Context: Direct acting antivirals (DAAs) have recently emerged as a promising therapeutic regimen for the treatment of hepatitis C virus (HCV) infection, which is a major public health problem. Among the known DAAs, daclatasvir (DCV), an inhibitor of the non-structural 5A protein, has been used in combination with several drugs for treatment of infection with HCV of different genotypes under different conditions. We conducted a systematic review and meta-analysis of combination therapy with DCV. Evidence Acquisition: We performed a systematic search in PubMed, Scopus, Science Direct and Web of Science with appropriate keywords for DCV. Studies that evaluated any regimen containing DCV and reported the sustained virological response (SVR) 12 weeks after therapy based on the HCV genotype, treatment duration and use of ribavirin (RBV) were included. The selected studies were considered for meta-analysis using STATA 11.0. Results: We found six different regimens containing DCV: DCV/asunaprevir (ASV), DCV/ASV/beclubavir, DCV/pegylated interferon lambda or alpha/RBV with or without ASV, DCV/simeprevir, DCV/VX-135 and DCV/sofosbuvir (SOF). Most of these regimens were used for the treatment of HCV genotype 1 infections, and in most cases, treatment failure was noted in subtype 1a infections. Among all these regimens, DCV/SOF with or without RBV for 12 or 24 weeks was found to be an efficacious approach for treatment of different types of patients with infections with different HCV genotypes. Conclusions: Among the treatment regimens containing DCV, DCV/SOF has the highest SVR rate for the treatment of infection with different HCV genotypes in different patient contexts; thus, this regimen shows promise for the treatment of HCV infections. Hepatitis C virus (HCV) infection has an estimated global prevalence rate of 2.8% and affects more than 185 million people worldwide (1). Chronic hepatitis C infection can lead to liver fibrosis, cirrhosis, hepatocellular carcinoma (HCC) and even death (2). HCV and hepatitis B virus (HBV) infection are major risk factors for HCC. Moreover, it has been reported that HCV has a higher prevalence than HBV in HCC cases in most European, Americans and North African countries (3, 4). While the incidence rate of HCV is decreasing in some countries, its morbidity and mortality rates are expected to increase during the next few decades (5, 6). HCV-infected patients remain asymptomatic for a long period, as a result of which this disease remains undiagnosed in most patients (7). Fortunately, HCV treatment can majorly decrease its associated complications (8). The recent revolutionary advances in HCV therapy have completely changed the treatment approaches. In particular, interferon-free regimens with direct-acting antivirals (DAAs) are now in use. The main advantages of DAA therapy are its fewer side effects, shorter treatment duration and significantly higher rate of sustained virological response (SVR) (9). Different combinations of DAAs have been used against different HCV genotypes and in different types of patients such as treatment naïve (TN) or treatment experienced (TE), cirrhotic or non-cirrhotic, and liver transplanted (LTx) patients. Among the DAAs in use, daclatasvir (DCV), which inhibits the HCV non-structural (NS) 5A protein, has been used in combination with pegylated interferon (PEG-IFN) alpha or lambda and ribavirin (RBV) and also with some other DAAs such as asunaprevir (ASV), beclubavir (BCV) and sofosbuvir (SOF) against different HCV genotypes, and they have exhibited different SVR rates (10). There is a growing body of literature about these regimens in different conditions, and there is therefore a need to review these studies in order to determine which regimens are appropriate for specific conditions. In this systematic review and meta-analysis, we aimed to evaluate effect of different regimens containing DCV on HCV treatment. We comprehensively and systematically searched the following electronic databases: PubMed, Scopus, Science Direct and Web of Science. We used appropriate combinations of the following keywords: daclatasvir, Daklinza and BMS-790052. No language limitation was considered in our search strategy. Our last search was performed on July 25, 2016. Moreover, the references of the included papers were evaluated for any related studies that were missed out in the search. All clinical trials and cohort studies evaluating HCV treatment regimens containing DCV were included in this systematic review and meta-analysis, and no limitation was placed on the treatment duration. Both journal articles and meeting abstracts were considered. 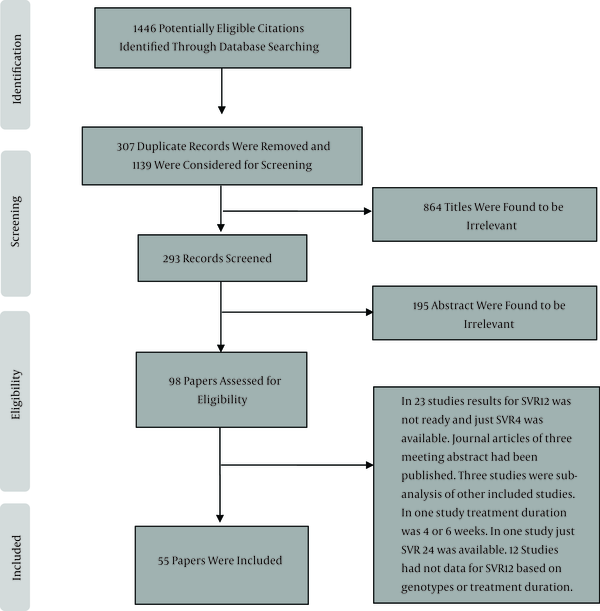 All the reviewing and screening processes in this study were based on the PRISMA guidelines for reporting systematic reviews (11). We independently investigated the title, abstract and full text of papers identified through the database searches. After each level of screening, we discussed the included and excluded papers and resolved any discrepancies. We performed a critical evaluation of the studies with regard to sample size, selection bias (including the treatment of patients with different degrees of liver disease or patients with a history of previous treatment that could influence the SVR rate) and the SVR rate reported 12 weeks after the end of therapy based on the HCV genotype, treatment duration and use of RBV. We extracted the following data from each of the included studies: publication year, sample size, median or mean age, gender, history of previous treatment, HCV genotypes, cirrhosis status, treatment duration, use of RBV, rate of SVR at post-treatment 12 weeks (henceforth referred to as “12-week SVR rate”) and relapse. All analyses were performed with the STATA software, version 11.0. We used random- or fixed-effect models for meta-analysis of included studies based on the existence of heterogeneity between results of them. Heterogeneity was assessed using chi-squared and I-squared (lies between 0 and 100) tests. P values less than 0.1 were considered to indicate statistically significant heterogeneity in the chi-squared test. Two commands metan and metaprop were used to calculate the pooled 12-week SVR rate and 95% confidence interval (CI). The ftt option was combined with the metaprop command to obtain an admissible CI (12). We found 1446 papers through our search of the databases, and after all duplicates were excluded, 1139 papers were considered for screening. After the title and abstract were screened, 98 papers were selected, from which 55 were finally found to be eligible for inclusion (Figure 1). The HCV treatment characteristics of the included studies are shown in Tables 1 to 4 and in the below sections. Abbreviations: RBV, ribavirin; SVR, sustained virological response; W/O, without; TN, treatment naïve; TE, treatment experience; SLD, severe liver disease; LTx, liver transplantation. aPatients in this study are ineligible for interferon treatment or intolerant to interferon. bThe 24-week SVR rate in this study was considered. dPatients have oral lichen planus. aThe patients were treatment-naive or had less than 4 weeks of exposure to ribavirin or interferon-based therapy. bTwenty patients were treated with ASV (200 mg, BD) and 21 patients were treated with ASV (200 mg, QD). All of them were given DCV (60 mg, QD). dThe patients underwent a 4-week lead-in phase with peg-IFN/RBV and then a treatment regimen of DCV/ASV/PEG-IFN for 24 weeks. e17 patients did not achieve protocol defined response, and after 12 weeks of DCV/PEG-IFN therapy, they received only PEG-IFN for another 12 weeks. fThose without an extended rapid virologic response (undetectable HCV-RNA at weeks 4 and 12) underwent an additional 24 weeks of treatment with PEG-IFN/RBV. g12 weeks of treatment with DCV and 12 more weeks without DCV. hPatients in this study had hemophilia. aPatients in this study are at a high risk of hepatic decompensation or death within 12 months if left untreated. bIncluding 12 cases of liver transplantation and 5 cases of HIV coinfection. cSome patients have HIV infected and some have undergone liver transplantation. dIncluding 15 cases of liver transplantation and 10 cases of HIV coinfection. ePatients in this study have advanced liver disease. fThree patients in this study had HIV infection. We found the following HCV treatment regimens containing DCV: DCV/ASV, DCV/ASV/BCV, DCV/PEG-IFN lambda or alpha/RBV with or without ASV, DCV/SMV, DCV/VX-135, and DCV/SOF. RBV has been used in some of these regimens. A summary of the results of the meta-analysis of different regimens is presented in Table 5. The results of other studies that were not included in the meta-analysis can be found in the below sections or in Tables 1 - 4. Abbreviations: DCV, daclatasvir; ASV, asunaprevir; BCV, beclubavir; PEG-IFN, pegylated interferon; RBV, ribavirin; SOF, sofosbuvir; SVR, sustained virological response; W/O, without; TN, treatment naïve; TE, treatment experience; SLD, severe liver disease; CI, confidence interval. The characteristics of the studies on the DCV/ASV/BCV regimen are shown in Table 1. We found 27 papers that evaluated the effects of a 24-week treatment with DCV/ASV without RBV in HCV genotype 1-infected patients. Most of the studies were on subtype 1b, and only three of the studies were on subtype 1a (13, 24, 28). Only studies that reported the 12-week SVR rate based on HCV subtypes and treatment history were included in this meta-analysis. Moreover, studies with a sample size of less than 10 were excluded. There was no enough study for genotype 1a based on the mentioned criteria and we could not do meta-analysis for this subtype. We therefore conducted a meta-analysis of the effect of this regimen on infection with HCV subtype 1b based on previous history of treatment. For TE patients infected with HCV subtype 1b, eight studies (14, 15, 17-19, 23, 25, 27) with a total sample size of 570 were included. We used the random-effect model (χ2 = 18.34, P = 0.01, I2 = 61.8%, τ2 = 28.05) and the pooled 12-week SVR rate was 86.74% (95% CI = 81.79 - 91.68). (Forest Plot 1 in the supplementary file). There was no publication bias, based on the results of Egger’s (P = 0.875) and Begg’s (P = 0.805) tests. Furthermore, four studies (18, 23, 25, 27) with a total sample size of 513 were included for meta-analysis of the 24-week DCV/ASV regimen without RBV in TN patients infected with HCV subtype 1b. No heterogeneity was found between the results of these studies (χ2 = 1.42, P = 0.70, I2 = 0%). The pooled 12-week SVR rate was 91.04% (95% CI = 88.57 - 93.51) (Forest Plot 2 in the supplementary file). We found no publication bias, based on the results of Egger’s (P = 0.822) and Begg’s (P = 0.497) tests. The characteristics of the studies on the DCV/ASV/BCV regimen are shown in Table 2. Different doses of BCV (75 or 150 mg) with or without RBV were administered for 12 or 24 weeks in TN and TE patients infected with HCV genotype 1a, 1b and 4. The meta-analysis only included studies with a sample size of more than 10 patients that reported the 12-week SVR rate separately based on the HCV genotype, use of RBV, treatment duration, history of treatment and dose of BCV (75 or 150 mg). For genotype 1b-infected TN patients who underwent 12 weeks of the aforementioned regimen (75 mg BCV) without RBV, three studies (35, 37, 38) (total sample size = 113) were included. We used fixed-effect model (χ2 = 1.48, P = 0.48, I2 = 0%), and the pooled 12-week SVR rate was 99.00 (95% CI = 95.00 - 100) (Forest Plot 3 in the supplementary file). Moreover, no publication bias was found based on Egger’s (P = 0.811) and Begg’s (P = 0.602) tests. For genotype 1a-infected TN patients who were administered 75 mg BCV without RBV for 12 weeks, four studies (34, 35, 37, 38) (total sample size = 348) were included in the meta-analysis. In the case of these studies, too, we used the fixed-effect model (χ2 = 0.25, P = 0.96, I2 = 0%), and the pooled 12-week SVR rate was 89.70 (95% CI = 86.51 - 92.89) (Forest Plot 4 in the supplementary file). There was no publication bias based on the results of both Egger’s (P = 0.991) and Begg’s (P = 1) tests. Table 3 shows the characteristics of studies on the DCV/PEG-IFN/RBV regimen with or without ASV We found two studies (45, 46) which investigated the effect of this regimen on patients with genotype 1b infection (total sample size = 333). In these two studies, the patients were administered PEG-IFN lambda for 24 weeks. In the first 12 weeks, they were also administered DCV. We found no heterogeneity between these studies (χ2 = 0.04, P = 0.85, I2 = 0%) and based on the fixed-effect model the pooled 12-week SVR rate was 88.89 (95% CI = 85.52 - 92.26). No publication bias was found based on the results of Begg’s test (P = 0.317). Egger’s test was not performed because the number of studies was too low. Three studies (17, 41, 42) (total sample size = 249) were included in the meta-analysis of the DCV/PEG-IFN alpha/RBV regimen administered for 24 weeks in genotype 1a HCV-infected patients. All the patients had previously undergone treatment for HCV infection. In one of these three studies (17), approximately half of the patients were administered ASV BD, and the other half were administered ASV QD. We found no heterogeneity between the results of these studies (χ2 = 4.11, P = 0.12, I2 = 51.3%) and based on the fixed-effect model, the pooled 12-week SVR rate was 90.41 (95% CI = 86.75 - 94.06). The P values derived from Begg’s and Egger’s tests were 0.602 and 0.048 respectively. The PEG-IFN/DCV regimen has been used in patients with genotype 2, 3 and 4 HCV infection (40-42). We found two studies (total sample size = 82) that evaluated this regimen; these studies also investigated the effects of DCV on TE patients infected with HCV genotype 4. No heterogeneity was found between the results of these studies (χ2 = 0.01, P = 0.92, I2 = 0%). The pooled 12-week SVR rate for this regimen was 98.00% (95% CI = 93.00 - 100), and Begg’s test did not reveal a publication bias (P = 0.317). Continuation of treatment with DCV and PEG-IFN in some studies was based on acquiring a protocol defied response (PDR), which is defined as an HCV-RNA level less than the lower limit of quantification at week 4 and undetectable at week 10 of treatment. After PDR was examined, the patients were re-randomized to determine whether they would receive the PEG-IFN with DCV or placebo treatment. In one of the studies, 145 patients (genotype 1a = 113, genotype 1b = 31 and genotype 4 =13) were treated with DCV (60 mg) plus PEG-IFN alpha: 12-week SVR was achieved in 88 (60.3%) genotype 1 and 12 (100%) genotype 4 patients (47). In another study, TN patients (n = 8) and prior non-responders (n = 9) were treated with DCV (60 mg) and PEG-IFN alpha for 24 or 48 weeks based on the PDR. A 24-week SVR was achieved in all the TN patients and 7 of the 9 prior non-responders (48). Because treatment was continued based on PDR for 24 or 48 weeks in these studies, we were unable to determine the 12-week SVR rate for treatment with PEG-IFN alpha/DCV, and therefore, we did not include these studies in our meta-analysis. DCV/SMV with or without RBV has been used for the treatment of HCV genotype 1 infection in different settings, including in LTx (49), TN and TE patients (50), and also in a kidney transplant patient (51). Because of differences in the duration of therapy (12 or 24 weeks), the use of RBV, history of previous treatment and subtypes (1a or 1b), we preferred not to pool the data of these three studies. Eighteen LTx patients were treated with DCV/SOF with (n = 12) or without (n = 6) RBV for up to 24 weeks: the 12-week SVR rate was 50.00% and 83.33% in the with and without RBV groups respectively (49). Zeuzem et al. (50) reported a 12-week SVR rate of 84.9% and 74.5% in TN patients treated with DCV/SMV and DCV/SMV/RBV respectively. For null responders, they reported a 12-week SVR rate of 69.60% and 95.00% for the DCV/SMV and DCV/SMV/RBV treatments respectively. The DCV/VX-135 combination has been evaluated in a phase 2a clinical trial of TN patients with HCV genotype 1 infection. VX-135 at a dose of 100 mg (n = 11) or 200 mg (n = 12) was administered with DCV (60 mg) for 12 weeks. A 12-week SVR rate of 73% and 83% was achieved in the 100 and 200 mg VX-135 groups respectively (52). The characteristics of the studies on the DCV/SOF regimen with or without RBV are shown in Table 4. In order to conduct a meta-analysis of these studies, we categorized them into three groups. Group A includes studies that evaluated the effect of the aforementioned regimen on patients without severe liver disease (SLD). As seen in Table 4, most of the patients in this group did not have cirrhosis or had compensated cirrhosis. Moreover, there are probably a few cases of decompensated cirrhosis in some of the study arms in this group, but we were unable to exclude them. Therefore, we included these studies in the meta-analysis of group A. Group B includes patients with SLD, most of whom had decompensated cirrhosis and some other were at a high risk of hepatic decompensation or death within 12 months if left untreated. As international guidelines suggest that patients with HIV/HCV co-infection should not be considered as a special population for DAA treatment (53), we included studies on these patients in either group A or B, according to the liver status. Finally, Group C includes studies on LTx patients. We have only presented the studies in this group in Table 4. A meta-analysis of these studies will be published in our future work on the use of DAAs in LTx patients. For conducting the meta-analysis in each group, we need to know the 12-week SVR rate based on the HCV genotype, the use of RBV and treatment duration. Therefore, we did not include studies that did not report these data. However, because of the low number of studies in each meta-analysis, we did not consider history of previous treatment and subtypes here. On the other hand, studies with a sample size of less than 10 were not included in the meta-analysis. All these data are presented in detail in Table 4. Based on the aforementioned criteria for meta-analyses and the available studies, we could only conduct a meta-analysis for DCV/SOF in patients infected with HCV genotype 1. For the DCV/SOF regimen without RBV in genotype 1 HCV-infected patients, we included four studies (54, 55, 56, 78) with five different arms (total sample size = 267): There was significant heterogeneity between the studies (χ2 = 14.80, P = 0.01, I2 = 72.97%) and based on the random-effect model, the pooled 12-week SVR rate was 97% (95% CI = 92.00 - 100.00%). No publication bias was found based on the results of Begg’s test (P = 0.32) and Egger’s test (P = 0.77). For the 12-week DCV/SOF/RBV regimen in HCV genotype 1-infected patients, we found two studies with a total sample size of 52 (55, 56). There was no heterogeneity between these studies (χ2 = 0.02, P = 0.88, I2 = 0%) and based on the fixed-effect model the pooled 12-week SVR rate was 97.00% (95% CI = 90.00 - 100.00). (Forest Plot 9 in the supplementary file). Moreover, there was no publication bias according to the results of Begg’s test (P = 0.31). We found two studies (three different arms) that evaluated a 24-week DCV/SOF regimen in HCV genotype 1-infected patients (54, 55). The total sample size was 224. There was no heterogeneity between the studies (χ2 = 4.34, P = 0.11, I2 = 53.90%). Based on the fixed-effect model we calculated the 12-week SVR rate to be 96.00% (95% CI = 93.00 - 99.00). Moreover, we did not find a publication bias (Begg’s test, P = 0.60; Egger’s test, P = 0.09) (Forest Plot 10 in the supplementary file). Two studies (three different arms) with total sample size of 97 patients were included for meta-analysis of the 24-week DCV/SOF/RBV regimen in HCV genotype 1-infected patients (54, 55). Based on the fixed-effect model, there was no heterogeneity between the studies (χ2 = 0.13, P = 0.94, I2 = 0%), and the 12-week SVR rate was 100.00% (95% CI = 96.00 - 100.00) (Forest Plot 11 in the supplementary file). We found no publication bias according to the results of Begg’s test (P = 0.60) and Egger’s test (P = 0.11). Foster et al. (57) treated five SLD patients with genotype 1 HCV infection with the DCV/SOF regimen for 12 weeks: the 12-week SVR rate was reported in three cases (60.00%, 95% CI = 20.94 - 90. 56). We found no similar studies that could be used for a meta-analysis. Two studies (n = 86) were included in the meta-analysis of the 12-week DCV/SOF/RBV regimen in HCV genotype 1-infected SLD patients (58, 57). There was no heterogeneity between the studies (χ2 = 0.07, P = 0.79, I2 = 0%) and based on fixed-effect model, the pooled 12-week SVR rate was 85.00% (95% CI = 76.00 - 92.00) (Forest Plot 12 in the supplementary file). No publication bias was found based on Begg’s Test (P = 0.31). We found two studies (n = 102) that evaluated the 24-week DCV/SFO regimen in HCV genotype 1-infected SLD patients (59, 58). Based on the fixed-effect model, there was no heterogeneity between these studies (χ2 = 0.09, P = 0.76, I2 = 0); moreover, the pooled 12-week SVR rate was 98.00% (95% CI = 94.00 - 100) (Forest Plot 13 in the supplementary file). No publication bias was found based on Begg’s test (P = 0.31). One study (59) with a sample size of 31 patients with HCV genotype 1 infection with SLD evaluated the effect of the DCV/SOF/RBV regimen for 24 weeks: the 12-week SVR rate reported was 96.77% (95% CI = 85.89 - 99.64). This is the first systematic review and meta-analysis of all HCV treatment regimens that include DCV. As mentioned before, DCV has been used in combination with PEG-IFN alpha, lambda and other DAAs such as ASV, BCV, SMV, VX-135 and SOF. Here, we have analyzed the studies based on the regimen used and HCV genotype. Combination therapy with PEG-IFN alpha/RBV for 48 weeks has been considered as a standard of care treatment (SOC) and is associated with an SVR rate of 50% in HCV genotype 1-infected patients. The success of this SOC is dependent on many viral as well as patient factors such as the HCV genotype and interleukin 28B; moreover, it is also associated with several side effects. Based on new research on the HCV replication cycle, drugs which act directly on the viral proteins (DAAs, as described before) have been developed. These DAAs have completely changed the approach of HCV therapy. In this regimen, DAAs of the same or different classes are introduced one after another in close succession. Each class of DAAs targets a specific viral protein such as NS3/4A, NS5A and NS5B (9). DCV targets NS5A, which has significant effects on viral replication and interaction with host cells. The first clinical results for DCV were reported in 2010 by a researcher at Bristol Mayer Squibb (BMS): in a phase 1 clinical trial: a reduction of 3.3 log10 was observed in the mean viral load of patients 24 h after administration of a single 100-mg dose of DCV, which was sustained for an additional 120 hours (61). As the enzymatic activity of the NS5A protein is not yet clearly understood, the exact mechanism underlying the inhibition of the function of this protein by DCV is not well understood yet. However, it is believed that DCV modulates the NS5A phosphorylation status and can interfere with the function of new HCV replication complexes, but it does not affect the pre-formed HCV complexes (62). The introduction of an NS5A inhibitor is a valuable contribution to HCV therapy, but this drug needs to be combined with PEG-IFN or other DAAs to overcome drug resistance, increase antiviral efficacy and decrease side effects (63). DCV is metabolized by liver CYP3A4 and is directly excreted via the biliary system. Single-dose pharmacokinetic studies have shown that DCV is well tolerated in patients with liver or renal failure without the need for dose adjustment (64, 65). BMS-650032 or ASV, which is an HCV NS3 protease inhibitor, has shown high treatment efficacy when used in combination with DCV and/or PEG-IFN in patients infected with HCV genotype 1 (13, 66). DCV/ASV has been mainly used in patients with HCV genotype 1 infection and mainly in Japanese studies. Further, subtype 1a has been evaluated in only a few studies, and it seems that this regimen is appropriate only for HCV subtype 1b. The treatment duration in all studies was 24 weeks, and RBV was not used in any of the studies. Our meta-analysis showed that the 12-week SVR rate for TN and TE patients with HCV genotype 1 infection was 91% and 87% respectively. In a network meta-analysis, the 24-week DCV/ASV regimen was evaluated in TN patients (two studies, n = 265) and TE patients (two studies, n = 233) with HCV genotype 1 and 4 infection: the 12-week SVR rate reported was 83.07 (95% CI = 75.99 - 90.00) and 62.85% (95% CI = 15.23 - 100.00) for TN and TE patients respectively (53). A considerable increase in the SVR rate was observed with these regimens in comparison with the SOC treatment. However, a more efficacious treatment regimen with a higher SVR rate is required. BCV is another product of BMS that inhibits the HCV NS5B protein (67). Different doses of BCV (75 mg or 150 mg) have been used in combination with DCV and ASV. The addition of this drug to the DCV/ASV regimen was found to improve the SVR rate in HCV-infected patients. This 12- or 24-week treatment regimen has been mainly used for the treatment of patients infected with HCV genotype 1 (subtypes 1a and 1b) and 4. Furthermore, RBV has also been added to this regimen in some studies. Most cases of treatment failures in these studies were found in subtype 1a infections. Our meta-analysis showed that a 12-week DCV/ASV/BCV regimen without RBV can provide a 12-week SVR rate of 89% and 99% for TN patients infected with HCV genotype 1a and 1b respectively. This treatment approach has also been shown to be very effective in HCV genotype 4 infections. However, it seems that this regimen does not provide a favorable SVR rate in genotype 1a infections. Some studies have evaluated the combination of DCV with PEG-IFN lambda or alpha with RBV. These combinations have been mainly investigated in HCV genotype 1, 2, 3 and 4 infections, and the treatment duration was 12 to 48 weeks and differed between studies. In addition, some of these studies used ASV in combination with other drugs. The findings of our meta-analysis indicate that a 12-week SVR rate of 98% can be achieved in patients infected with genotype 4 with the PEG-IFN alpha/RBV/DCV/ASV regimen. This combination resulted in a 12-week SVR rate of 90.41% in TN patients with HCV genotype 1a infection. The treatment duration for these two regimens was 24 weeks. Moreover, these regimens include PEG-IFN, which is known to have certain side effects. As mentioned before, data on the combination of DCV and SMV (an inhibitor of the NS3/4A protein) are very limited, and this regimen has been used only in HCV genotype 1 infections. Moreover, this regimen has shown different 12-week SVR rates (from 50% to 95%) in TN, TE and LTX patients. Thus, combining VX-135, an inhibitor of NS5B polymerase, with DVV should be further investigated before it is used for HCV treatment. Although all of these aforementioned regimens have considerably improved SVR rate compared with SOC treatment which was combination of PEG-IFN alpha/RBV however, BMS could not provide a same treatment approach with highest SVR rate and least treatment duration to be used in different GTs and conditions. Since there are treatment regimens associated with a 12-week SVR rate of more than 95%, we recommend that all other treatment approaches with an SVR rate below 90% be avoided. One of the regimens with an SVR rate of more than 95% is DCV/SOF. SOF, which is a product of Gilead, targets the NS5B polymerase and poses a high barrier against resistance. It is now used as the backbone for several interferon-free regimens (68, 69). The European medicine agency approved of combination therapy with DCV and SOF for the treatment of genotype 1 - 4 infections in 2014. Moreover, this treatment regimen was approved by the FDA first for genotype 3 infections in 2015 and then for genotype 1 infections in 2016 (70). As mentioned in the results section of this paper, patients with genotype 1 - 6 infections, including those with and without a history of previous treatment, with and without cirrhosis and liver and kidney transplantation, have been treated with this treatment approach. Further, in some settings, the use of RBV can also be helpful. However, it seems that adding RBV in some cases, such as genotype 3 infections, does not make a significant difference (71). Based on the available literature, it seems that until now, treatment with this regimen has focused on genotype 1 and 3 infections first and then other genotypes. Based on our results, HCV genotype 1 infections in patients without SLD can be treated using DCV/SOF for 12 or 24 weeks with and without RBV, as all these approaches resulted in a 12-week SVR rate of more than 95%. In genotype 1-infected patients with SLD, use of the DCV/SOF regimen for 24 weeks resulted in a 12-week SVR rate of 98%. Because of the limited data available about infection with other genotypes, we did not conduct a meta-analysis on studies that used this regimen on other genotypes. However, based on the data presented in Table 5, it seems that DCV/SOF has an acceptable SVR rate in cases of other genotype infections, especially genotype 3 and 4. A network meta-analysis that combined the data for HCV genotypes 1 and 4 evaluated the effect of DCV/SOF on TN and TE patients separately (53). In agreement with our results, they reported a 12-week SVR rate equal to or more than 95% for both groups with the DCV/SOF regimen. Therefore, DCV/SOF with and without RBV for a duration of 12 or 24 weeks can be considered as a highly useful treatment option in TN or TE patients with genotype 1 and 3 infections with and without cirrhosis. However, their effects on genotype other than 1 and 3 need to be more investigated. In addition to the SVR rate, some other important factors, including the rate of serious adverse events (AEs), drug-drug interaction (DDI) and drug resistance, should be considered when selecting an appropriate treatment regimen under different conditions. The rate of serious AEs in genotype 1 and 4 infections treated with DCV/SOF has been reported to be 0.92% (96% CI = 0.00 - 2.49) and 3.22% (96% CI = 0.00 - 3.20) in TN and TE patients respectively. Furthermore, the rate of treatment discontinuation due to AEs in these patients was shown to be 0.05% (95% CI = 0.00 - 1.21) and 0.00 (95% CI = 0.00 - 2.25) respectively (53). As DCV can moderately inhibit organic anion transporting polypeptide (OATP) 1B1 and P-glycoprotein transporter (P-GP), DDI between DCV and P-GP and OATP1B1 substrates is a possibility. Importantly, some drugs such as anti-convulsants (e.g., phenytoin and carbamazepine) and antimycobacterial agents (e.g., rifampin) can affect the serum DCV concentration (72, 73). With regard to the treatment of patients with HIV/HCV coinfection, DDI between DCV and efavirenz, nevirapine and ritonavir is possible (53). With regard to drug resistance, NS5A polymorphisms at amino acid positions M28, Q30, L31, and Y93 have been associated with resistance to DCV. Therefore, before initiation of therapy with DCV/SOF in HCV genotype 1a-infected patients with cirrhosis, screening for these polymorphisms should be performed (74). Till date, DCV has been approved for treatment of HCV genotype 1b infections in Japan (in combination with ASV), for treatment of genotypes 1 - 4 infections in Europe (in combination with SOF), and for treatment of genotypes 1 and 3 infections in the USA (in combination with SOF) (10). In conclusion, we think that DCV is highly efficacious and safe for the treatment of patients with HCV infections under different conditions. Moreover, its ability to combine with other DAAs makes it a very good choice for HCV treatment.